To Manchester and our first hotel of the holiday, a glamorous Premier Inn. The receptionist's "I hope you don't mind waiting 15 minutes while we finish making your beds" turned out to be more actual than we first understood. They were literally assembling them. "You'll be the first to sleep in them", she smiled. It's amazing how much Manchester has changed since Liz lived here in the early 90s. The 1996 IRA bomb kickstarted the rejuvenation but it's not been limited to the city centre (Salford Quays has been utterly transformed for instance with The Lowry, Imperial Museum North and Media City), nor is it letting up. The excellent tram system is spreading, the Central Library has had a dramatic makeover, and the Cornerhouse has moved into a brand new arts centre, the painfully-named Home. Oh, and Whitworth Art Gallery reopened earlier this year following two years of renovation. 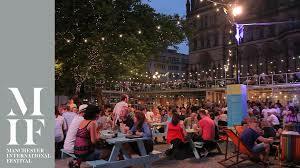 But perhaps the biggest development of recent times is the Manchester International Festival which has been running every other year since 2007. It's showcased Kraftwerk at the Velodrome, Bjork's Biophilia, Massive Attack v Adam Curtis and seemingly always something by Damon Albarn (this year's, just finished, presented his Wonder.land). In 2019 MIF will have a home in The Factory in the former Granada Studios. It's a far cry from the 60s to 90s when we had to be content with great bands but not-so-great venues (excepting the Free Trade Hall, Apollo and Hacienda of course). But it's not the venues that make the city tick, it's the bands: where are the new Joy Divisions, New Orders, Smiths, Stones Roses, Happy Mondays, Oases…?